Preheat oven to 350°. Cook noodles according to package directions; drain. Transfer to a shallow 3-qt. or 13×9-in. baking dish coated with cooking spray. AMeanwhile, in a large nonstick skillet coated with cooking spray, heat butter over medium-high heat. Add onion; cook and stir until tender. In a small bowl, whisk cornstarch, milk and seasonings until smooth; stir into pan. Stir in broth. Bring to a boil; cook and stir 2 minutes or until thickened. 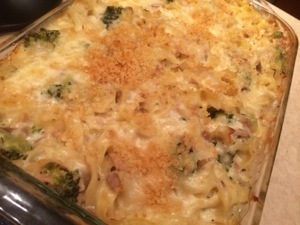 Stir in 3/4 cup cheese until melted; stir in broccoli and tuna. Spoon over noodles; mix well. Sprinkle with remaining cheese. Toss bread crumbs with melted butter; sprinkle over casserole. Bake, covered, 45 minutes. Bake, uncovered, 15-20 minutes longer or until cheese is melted. Yield: 8 servings.